I'm winding my way down on this collection, only 3 more to go--definitely one of the largest collections I've seen! As with all of the swatches I do on the China Glaze 'Tis the Season Collection, I'll be giving away these 2 shades (new), along with the Ruby Deer plush. Below: Ruby Deer, a perfect red creme for the holiday season or anytime of the year, applied and covered beautifully using 2 coats. This is a slightly lighter red than Phat Santa, the other red creme in the collection. I've said it before, but it deserves another mention--the creme shades have all applied extremely well and have only required 2 coats. They also seem to have an extra-high gloss finish. Below: Mrs. Claus has a tinted carnation pink base with foil glitter in similar shades. This one has a jelly-like texture, but still managed to apply surprisingly well. The glitter was evenly distributed, and 2 coats gave me a look I was happy with. The glitter is very sparkly and flashes silver tones with movement of your hand. Below: I thought Mrs. Claus might be one of those shades that works better as a top coat over another shade, but it really is pigmented enough to use alone. Here it is shown over Ruby Deer, but there are probably other shades in would look nice over, perhaps a pink, white, or even silver. I was busy lazy though, so I cheated and did it over what I already had on! I don't think I've come across a bad shade in this huge collection, so many thanks to China Glaze for once again exercising their creative abilities for us to enjoy! 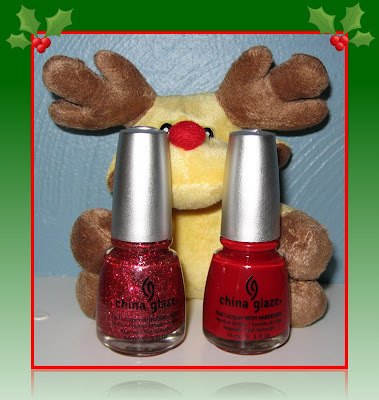 If you'd like to win these 2 shades and the plush reindeer, just leave your eMail in the comments section. I'll accept entries until I post my Come Monday Newsletter Monday morning, at which time the winner will be announced. I already have Mrs Claus so I think I'm going to skip this one and give someone else the chance to win this lovely set! Love the layering you did with them! Love love loving Mrs. Claus! Again, two very lovely shades! 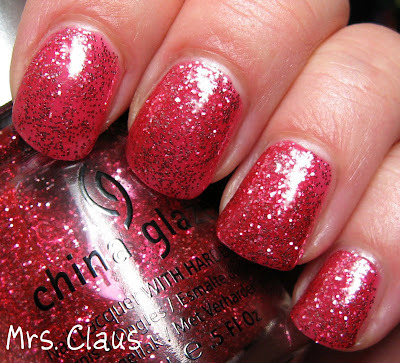 I like them both a lot and I think Mrs. Claus indeed is nice for layering. I have to say that Ruby Deer is my favorite of these two. I love a gorgeous red creme. I don't know what I was expecting from Mrs. Claus, but I felt a little left down by it. I have Frosty, Snow and Party Hearty...so pretty! LOVE Mrs Claus. And the plushie! 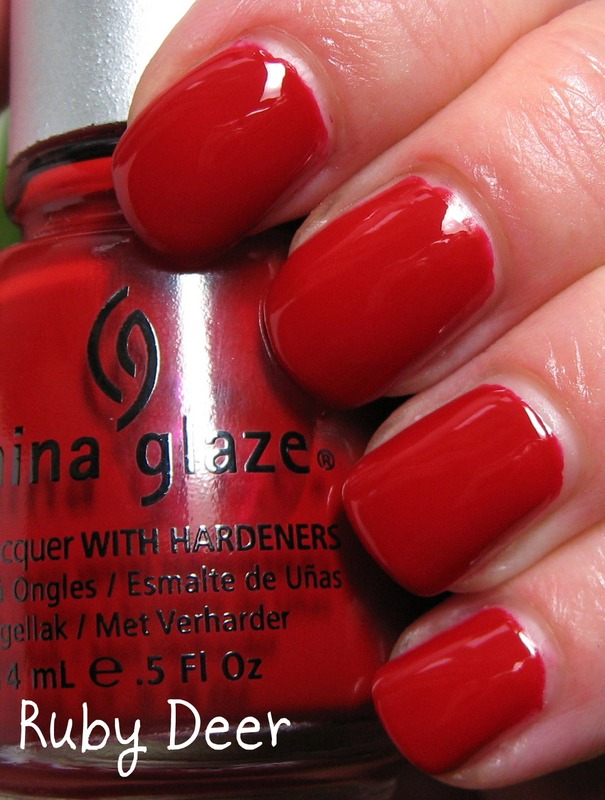 I don't generally like red polish, but there is something very appealing about these two. Hello. I love this polishes! So pretty! yahoo email is waschbare. Thanks for the lovely swatches and the giveaways! Wonderful gift! Please enter me in the giveaway. Love that red. Thank you. I want this whole collection. The swatches look great on every blog I've seen them on. Wow that red is very pretty! And the glittery red is lovely too. Aww the plush is sooo cute! Two favourites of mine from this collection! akuma[dot]kanji[at]gmail[dot]com ;) Thanks for the opportunity! I know the giveaway is gone, but I need to say this shades are awesome!